Creamy, dreamy, delicious, and good for you!! 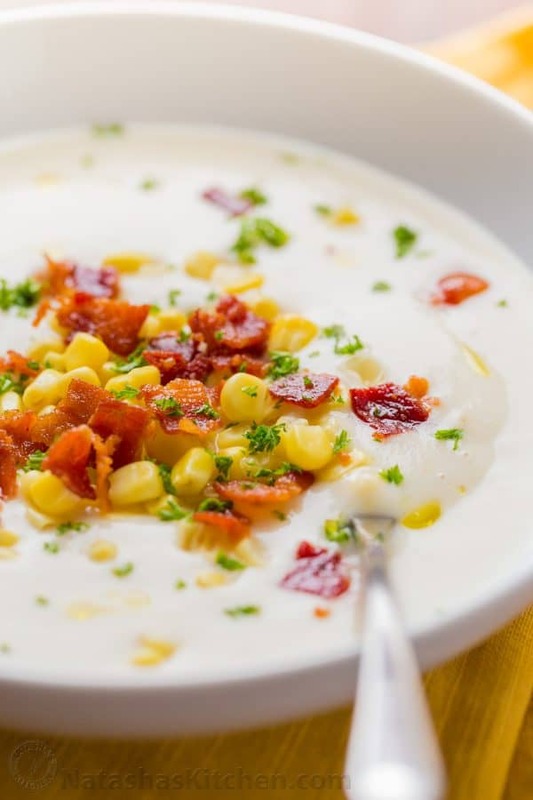 This creamy cauliflower soup is loaded with sweet corn and crunchy bites of bacon and it’s well loved by everyone in our family. 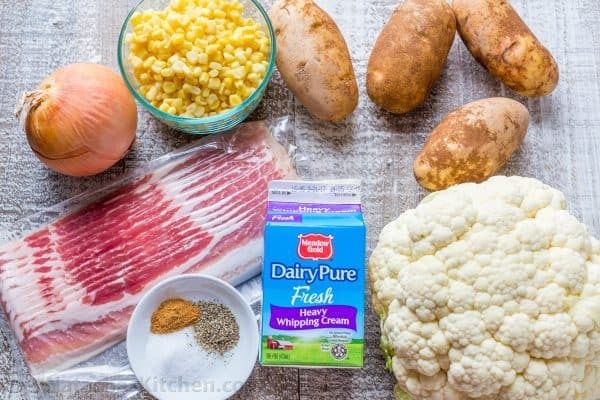 This recipe makes a full pot of cauliflower soup, but it disappears quickly and I always wish we had more when it’s gone! 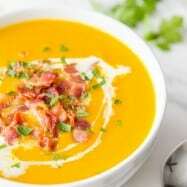 It reminds me of the soups we enjoyed at a 5-star resort on our honeymoon years ago. The dining was unforgettable and I was particularly smitten with their indulgent soups. This cauliflower soup has a rich gourmet flavor except the entire pot has (GET THIS) only 1 cup of cream! Seriously!! The cauliflower is the secret to the velvety smooth texture. Ladle hot cauliflower soup into shallow bowls and top with lavish amounts of sweet corn and crunchy bacon. Pair it with some fresh crusty bread and pretend you’re fine dining at home (where refills are always free) ;). 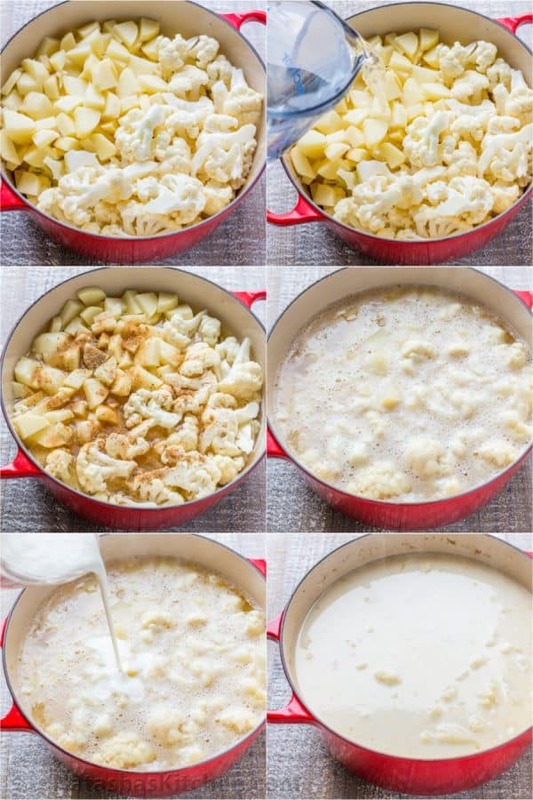 Enjoy this creamy cauliflower soup my friends. I hope this becomes a new favorite for you! 1. 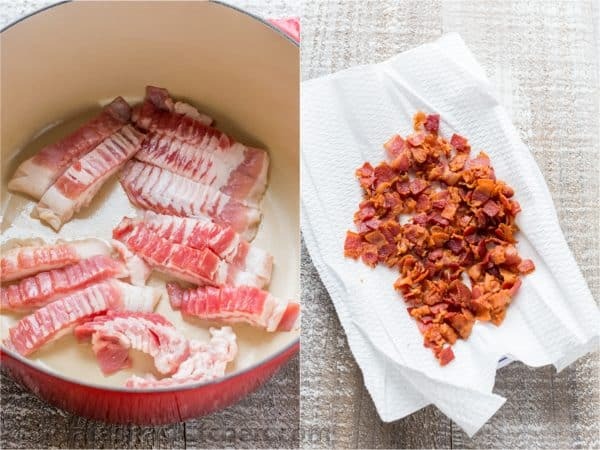 Cook bacon in a 5 1/2 qt+ heavy-bottomed soup pot or dutch oven over med/high heat until browned and crispy. Use a slotted spoon to remove to a paper-towel-lined plate. 2. Pour the bacon grease into a bowl. Spoon 3 Tbsp of bacon fat back into the pot and discard the rest. Add diced onion and sauté 5 minutes or until softened. 3. Add chopped potatoes and cauliflower, 7 cups warm water along with 4 tsp salt, 1/2 tsp black pepper and cayenne pepper to taste. Stir and bring to a boil. Once it boils, add 1 cup whipping cream then reduce heat to a simmer, cover and cook until potatoes are cooked through (about 15 minutes). 4. Meanwhile cook your corn (click for 15 minute fresh corn recipe, or cook frozen corn kernels according to package instructions. When out of season, I love the frozen organic from Costco). Drain and cover to keep warm. 5. 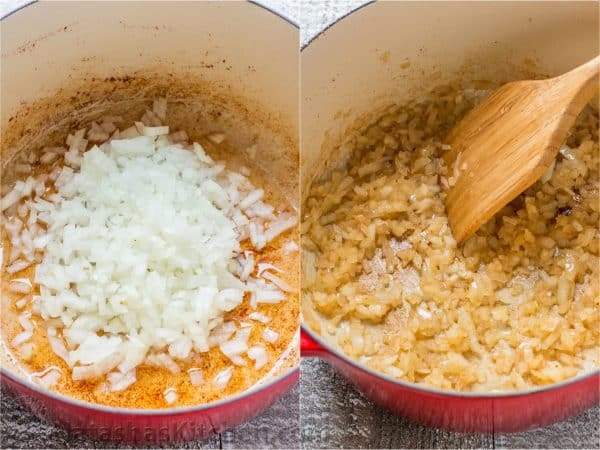 Blend the soup in batches in a blender until completely smooth (making sure your blender has a little breathing hole at the top so you don’t create a suction vacuum from the hot liquid. Blendtec has a built in opening at the top. Return soup to the pot and season to taste (for more of an adult soup, we add another 1/2 tsp cayenne). 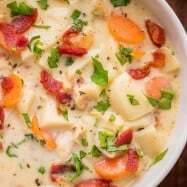 To serve, Ladle cauliflower soup into warm bowls and garnish generously with bacon bits, cooked corn kernels and fresh parsley. 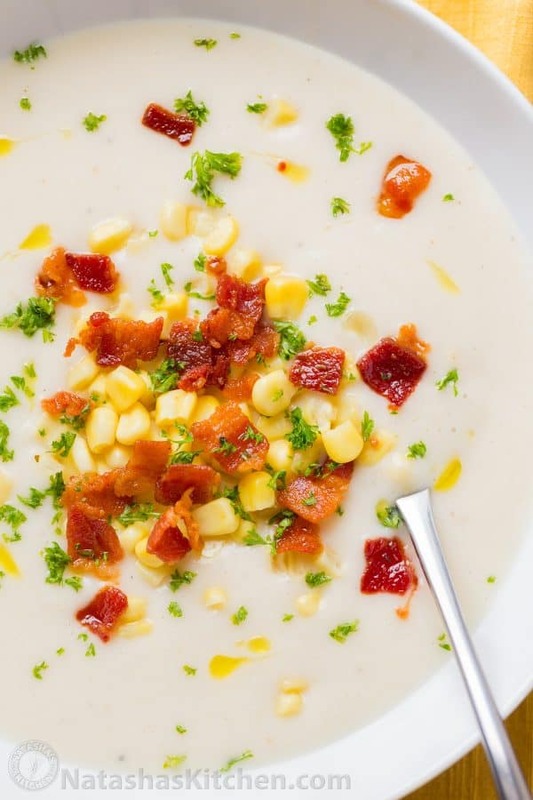 This creamy cauliflower soup is loaded with sweet corn and crunchy bacon. 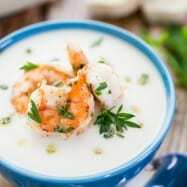 Creamy cauliflower soup has rich gourmet flavor and it's good for you! Cook bacon in a 5 1/2 qt+ heavy-bottomed soup pot or dutch oven over med/high heat until browned. Remove bacon with slotted spoon to paper-towel-lined plate. Pour the bacon grease into a bowl. Spoon 3 Tbsp of bacon grease back into the pot and discard the rest. Add diced onion and sauté 5 min or until soft. Add chopped potatoes and cauliflower, 7 cups warm water along with 4 tsp salt, 1/2 tsp black pepper and cayenne pepper to taste. Stir and bring to a boil. Add 1 cup cream, reduce heat to a simmer, cover and cook until potatoes are cooked through (about 15 min). Meanwhile cook your corn. Drain and cover to keep warm. Puree the soup in batches in a blender until completely smooth (making sure your blender has a little breathing hole at the top so you don't create a suction vacuum from the hot liquid. Return soup to the pot and season to taste (for an adult soup, we add another 1/2 tsp cayenne). 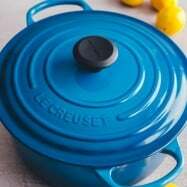 To serve, Ladle into warm bowls and garnish generously with bacon bits, cooked corn kernels and fresh parsley. 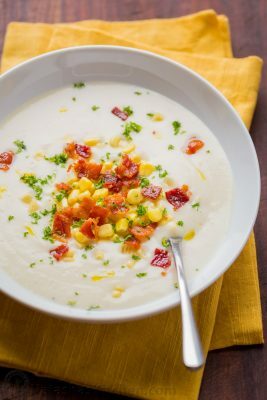 This cauliflower soup is velvety smooth, and the bacon-corn topping adds just the right amount of crunch and texture to every bite. So yummy!! Hi – I just discovered your site – all loving your recipes!! 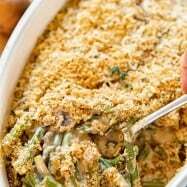 Has anyone tried substituting rutabagas for the potatoes to make this low carb? Loved this!! !so delicious and creamy! We don’t eat pork, so I didn’t use bacon. wow, i need to make that soup. 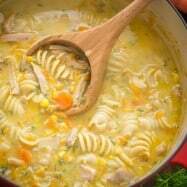 This soup is on the list! Have about 67 recipes written down!